History plays a large part in our present. It can affect who were are as people, but it also has the power to unite and bring people together. In A Letter to Harvey Milk, with book by Ellen M. Schwartz, Cheryl Stern, Laura I. Kramer, and Jerry James, music by Laura I. Kramer, lyrics by Ellen M. Schwartz, and additional lyrics by Cheryl Stern, a widower begins a writing class taught by a young woman who opens up his eyes to a history he's repressed. A captivating concept inspired by a short story by Leslea Newman, A Letter to Harvey Milk is one of those musicals that just has a little too much happening all at once. Harry Weinberg is a widower living in 1986 San Francisco. After the spirit of his deceased wife urges him to get out of the house to allow his depression and heartbreak to subside, he finds himself in a Jewish heritage writing class taught by Barbara Katsef, a young woman who found herself in California via the East Coast. One of his class assignments is to write a letter to someone who has passed. Rather than writing it to his wife, he writes it to Harvey Milk, the first openly-gay political leader in California. This single assignment opens up a bound between a very unlikely pair brought together by the past. Written with a classic sensibility, A Letter to Harvey Milk is a haunting story that tries to achieve a bit too much all at once. And this is proven by the most powerful twist at the end of the show that doesn't rear much significance any earlier. The work of fiction happens to showcase the power of plot cohesion. The way the story is presented, Harry and Barbara's friendship is strengthened by their individual connections to Harvey Milk. While he is an essential and historic figure, it's simply too coincidental, especially when the basis of the writing class and the twist at the end is centered around an incredibly powerful moment in Jewish history. Coincidence aside, there is still a lot going on in this not-so-brisk ninety-minute musical. Between a jilted ghost of wife, flashbacks upon flashbacks, slapstick comedy bits, and arresting sentimental moments, stylistically, A Letter to Harvey Milk is all over the place. The heart and soul of the show is not the titular person. It's the connection between an older Jewish gentleman and younger lesbian woman. In 1986 San Francisco, this might be unfathomable. But that is the draw into this show. Having the historical context of Harvey Milk and his power and the Holocaust certainly fulfills clues into Harry and Barbara's backstory, but when you introduce them in the manner that they are, you almost feel jilted that they're not the center of the show. The book writing team gives you snapshots of Harvey Milk through his interactions with Harry, a former kosher butcher, and through narratives of his untimely demise. And yet, if you took the character out of the show, the show can still truck along. The dialogue occasionally does have that forced, over-the-top feel that seeps into the lyrics from time to time. Though, you can forgive some of those hokey lyrics when you have such a sweeping sound. The score from Laura I. Kramer is sweet, elevated by the orchestrations from Ned Paul Ginsberg. Quite possibly the biggest triumph of A Letter to Harvey Milk is its representation of a queer woman in a musical. The character of Barbara is astonishing and Julie Knitel's performance is spectacular. Knitel has a flawless vocal. It's pristine and joyous. Her presence as Barbara is strong, yet amiable. She gives off that essence of pure desire to learn more. Julie Knitel truly gives a remarkable performance. As Harry, Adam Heller floats through the show. There aren't much, if any, levels to the character. Harry is solemn and content who doesn't really like to disrupt the status quo. Heller has a fine voice, but his performance truly comes to life late in the show with the big twist. In order for the musical to not be a complete downer of a drama, Frannie Weinberg is inserted as the comic relief. Cheryl Stern brings a classic sense of comedy to Frannie. She's loud and abrasive who has a comment for everything. She's a walking stereotype that delivers the laughs. 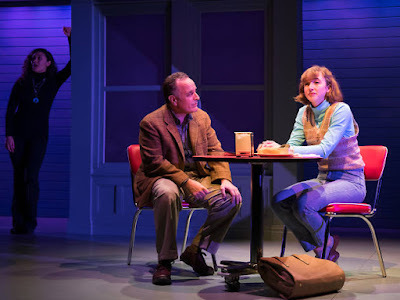 Point fingers toward the writing and direction, it does seem as if she is a part of a different play. While the majority of the ensemble took on spotlight moments, Jeremy Greenbaum as Yussl gave a powerful performance in the flashback. The look of fear and desperation in his eyes allowed the story to stop and become authentic and raw. You could feel the terror Greenbaum's Yussl was experiencing. With an exuberant amount of history to unpack in a single musical, director Evan Pappas opted for the less is more strategy. With the assistance of the idyllic set designed by David L. Arsenault, Pappas was able to move the story along with minimal pieces. If you had any doubts where the story took place, look up at stage left and the architecture of San Francisco was alive and well. Debbi Hobson's costume design was evocative of the time. It's safe to say that perhaps the source material may be flawed for adapting it into a stage musical. A Letter to Harvey Milk tells an important narrative. It's just the execution that is a little lacking. For those longing for a nostalgic style of theater, A Letter to Harvey Milk will certainly fulfill that. It's unfortunate how dated the show feels against the current landscape of musical theater.